Absfuel Primer Pre Workout Catalyst | Bio-Science Institute Inc.
Absfuel Primer is simply the best and most all inclusive pre work out supplement ever made. We start with 1000 mg of Agmatine which I like to refer to as Arginine on steroids. Agmatine is one of the most potent nitrous oxide (NO) producers. Yes many other pre workout supplements include arginine and some even include the more expensive agmatine but I challenge you to find one that includes 1000 mg of Agmatine per scoop. We then add 250 mg of L Norvaline. Simply put L-Norvaline is an arginase inhibitor. Arginase is what breaks down agmatine which limits its ability to produce NO. Studies show that L Norvaline can increase NO production by 55%. Other companies are trying to get cute with using different types of creatine. We go old school and use 5 grams of creatine monohydrate. All the studies that show how creatine can build muscle were done using monohydrate. If its beta alinine you seek we have that to. A generous 1500 mg per scoop. Yes, of course we include glutamine and all the BCAA's. When it comes to a pre workout supplement there are those that like a really strong stimulant and those that prefer just a little. 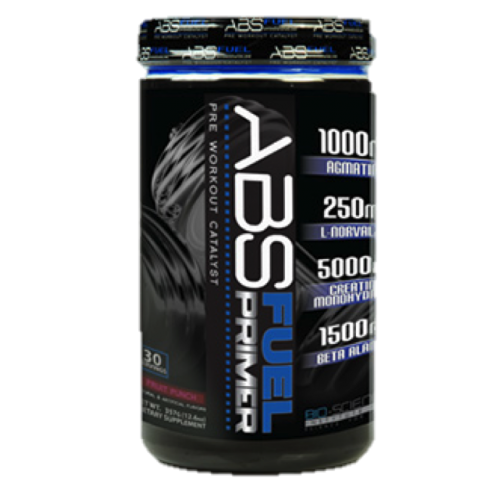 Absfuel Primer at its one scoop dose has 394 mg of caffeine plus 11 mg of synephrine. Make no mistake about it this is going to get you pretty amped up. I would suggest those that are sensitive to stimulants start with half of a scoop. The good news is even if you cut all the other ingredients in half this is still one of the most potent pre workout supplements on the planet. At the one scoop dose its off the charts. WHAT IS ABSFUEL PRIMER PRE-WORKOUT CATALYST? 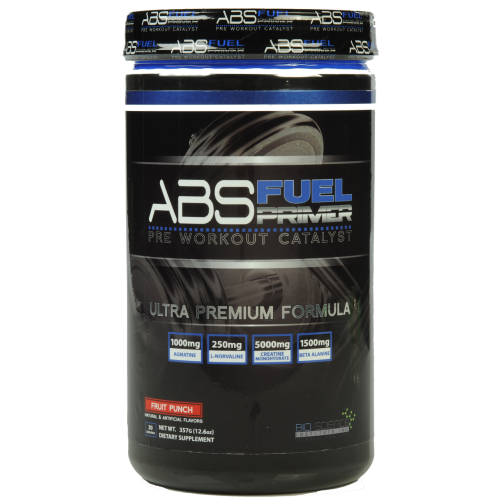 Absfuel Primer Pre-Workout Catalyst is arguably one of the best and most all inclusive pre-workout supplement made. We start with 1000 mg of Agmatine which I like to refer to as Arginine on steroids. Agmatine is one of the most potent nitrous oxide (NO) producers. Yes many other pre-workout supplements include arginine and some even include the more expensive agmatine but I challenge you to find one that includes 1000 mg of Agmatine per scoop. We then add 250 mg of L Norvaline. Simply put L-Norvaline is an arginase inhibitor. Arginase is what breaks down agmatine which limits its ability to produce NO. Studies show that L Norvaline can increase NO production by 55%. Other companies are trying to get cute with using different types of creatine. We go old school and use 5 grams of creatine monohydrate. All the studies that show how creatine can build muscle were done using monohydrate. If its beta alinine you seek we have that to. A generous 1500 mg per scoop. Yes, of course we include glutamine and all the BCAA's. When it comes to a pre-workout supplement there are those that like a really strong stimulant and those that prefer just a little. 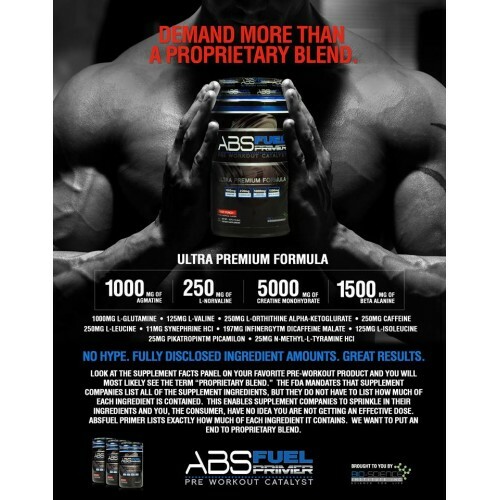 Absfuel Primer at its one scoop dose has 394 mg of caffeine plus 11 mg of synephrine. Fruit punch is the only flavor and may always be the only flavor. Absfuel Primer tastes really good which is kind of surprising in light of all the ingredients we pack into it. Agmatine tastes horrible and we use 1000mg which is not easy to mask but somehoew we did. It seems like people place a lot of importance on taste, which I really don't get. I would be more concerned with results. Fortunately, Absfuel Primer does taste great. Improve workout performance without the unnecessary caffeine. High quality and natural ingredients.